A Helenville native, Knoebel was one of two contestants vying for the crown. She was joined in her journey by Natalie Ciciva, of Waterloo. Knoebel explained that what she most is looking forward to during her reign is promoting the fair because she “grew up here” and wants more people to attend and be involved in the fair. In the fall, she will be entering her junior year at the University of Wisconsin-River Falls, where she is pursuing a double-major in animal science and dairy science, with the goal of becoming an animal nutritionist. Throughout the competition, the Fairest contestants participated in a variety of activities promoting the fair, including dairy breakfasts and parades, producing radio commercials, communicating with businesses and community members, and assisting the reigning Fairest of the Fair throughout fair week. The women were evaluated on professional appearance, community activities, personality, poise, fair knowledge and experience, speaking ability, a personal interview, radio commercial and their written application. As winner, Knoebel will go on to compete for the title of Wisconsin Fairest of the Fairs in the annual Wisconsin Association of Fairs Convention in January 2020. Eck will compete for the title in 2019, with Knoebel attending as a representative of the Jefferson County Fair. Ciciva, meanwhile, grew up on a livestock and horse farm and has shown horses at the Jefferson County Fair for the last 11 years. She was the 2014-15 Jefferson County Horse and Pony Project Equine Ambassador. She is the eldest daughter of John and Donna Ciciva and will be entering her senior year at William Woods University in Fulton, Mo., come fall. Ciciva is pursuing degrees in equestrian science and equestrian administration with a minor in business administration and plans to return to Wisconsin to attain her certified veterinarian technician degree. Prior to the crowning, the contestants were asked two final questions. First, the women drew a card and were asked how they would interact with the person as Fairest of the Fair. Knoebel was asked about interacting with a fair sponsor and Ciciva, a general fair-goer. Ciciva said she would begin by thanking the fair-goer for coming to the Jefferson County Fair. “This is a great time for many people, as they come here and it’s kind of like a family reunion,” she said. “Once you start in Jefferson County, you’re always in Jefferson County, so I would thank them for coming. Next, the two women were asked what three words they would use to describe the Jefferson County Fair and why they chose those words. Having shown at the fair for so long, Knoebel said, there never has been a year she has not enjoyed her time there, much of which is due to the welcoming atmosphere. “That is due to many of the people who showed here and just come to the fair,” she explained. “They are always so happy and, no matter what, how they do or how I do, we always congratulate each other and we’re always so happy to be here with one another. It’s always a highlight of the summer to come and see everybody who’s here because they are so welcoming and friendly. “Family,” “fun” and “excitement” were the words Ciciva selected. The fair is exciting because you “never know what you’re going to get,” she said, pointing to the sea lion show as an example. It’s fun because there’s “always something to offer. Ciciva said she chose “family” because, “once you start in Jefferson County, you end in Jefferson County. “It’s been something that really means a lot because the people that have been around to support me this week have been amazing,” Ciciva said through tears. “I lost one of my high school best friends in a car accident this past week, and (my fair family were the ones) putting a smile on my face and giving me the hug that I needed to push through for the week. While the judges deliberated on who would win the crown, 2018 Fairest of the Fair Kiley Eck spoke about her experience as Fairest. “In the past year, I’ve been asked about this pageant — I don’t like calling a pageant a pageant, I like to call it a program, but that’s a different story — how it’s changed me, my goals, if I’m ready to give up my crown, if I’m excited or thankful that it’s over,” Eck began. “Truthfully, I’m not quite sure. To me, I’m still just Kiley. I’m still the girl that I started off as. But, people tell me that I’ve made changes. The Fairest of the Fair program and the people she has met along the way have helped her accomplish that, she said. She thanked her family, everyone involved in the fair and the judges from last year and this year. Also, she thanked the 2018 Fairest contestants — Rachal Mark, Amber Ziebell, Amanda Griebenow and Bianca Bavuso — as well as Knoebel and Ciciva. 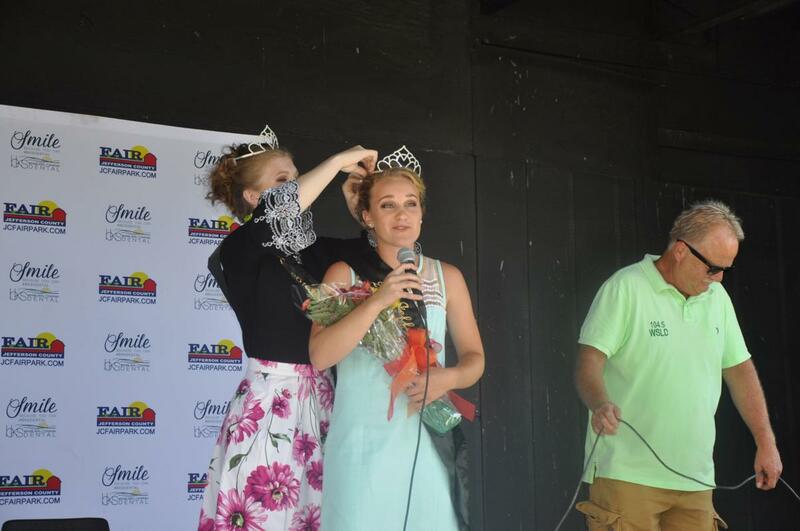 Speaking directly to Knoebel and Ciciva, Eck told them to “have fun and enjoy” as one of them continued their journey as 2019 Fairest of the Fair.